This serves as the master ballroom complete with adjustable lighting for ambiance, a complete wet bar, round tables, beige leather chairs, and decorative mirrors on the walls. It can seat up to 200 guests and has a private dance floor. This delightful room features an expanded dance floor and a fresh look! The Starlight Room can entertain up to 120 guests for dinner. A portable bar is available for use in this room as well. Wedding receptions are normally 5 hours long for seated functions with a dance, and 3 hours in duration for stand-up receptions. 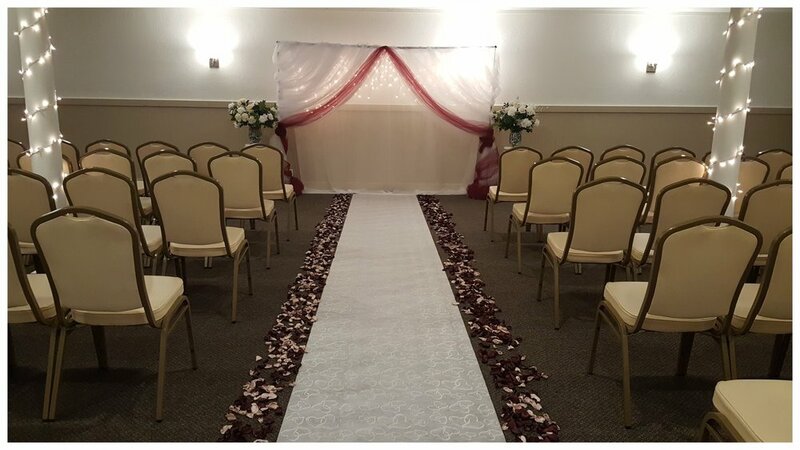 The Chapel can be set up in the Starlight room and is professionally decorated to beautifully accommodate your wedding service. Up to 175 guests can comfortably be seated and the Chapel is ideal for intimate, multi-denominational, or civil ceremonies. A newly updated wedding arch with beautiful white tulle and twinkling lights, will go with any theme or can be altered to match your wedding colors as well. Also provided for an elegant look, is our white pillars with white flower arrangements. Centennial 2 is the newest room! Equipped with a dance floor and staging room for food and additional tables for your needs. You can rent the meeting or celebration space for just $50.00 per hour, which includes linens and table skirting! You can provide your own food or we offer catering services as well. Centennial 2 can comfortably accommodate 50 or fewer guests. Features two bathroom facilities and a wet bar. Table settings, glassware, linen napkins, and centerpieces are available for a nominal fee. Room capacities vary according to the table, bar, and entertainment requirements. For planning purposes, room capacities are listed here. Wedding reservations and arrangements are provided on a first-come, first-served basis. Reservations for a particular room are determined by the number of guests, the arrangements, and the services to be provided. A tentative reservation may be made by phone or in person. The reservation for either room or a specific date is tentative and may be offered to another party until a deposit of $500.00 is made and the sponsor signs a catering agreement. The agreement needs to be signed for the event date to be officially reserved. In an effort to provide an environment acceptable for every guest, the facility is smoke free inside the facility. Every event is supervised by a trained, professional catering sales representative.